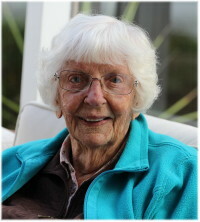 It is with profound sadness that we announce the peaceful passing of our beloved mother, grandmother, great-grandmother, aunt and friend, Ruth Dobbin, on Wednesday, March 27, 2019. Ruth was born in Old Pinawa, April 9, 1922, where she lived until she married Everett Dobbin in 1942. In 1963 they were one of the pioneer families who moved to “New” Pinawa where she lived a full and happy life and was fortunate to spend most of her 97 years in the place she loved the most……Pinawa. Always active, enjoying her bridge groups, oil painting in the early years and busy outdoors gardening, golfing, fishing, curling and involvement in numerous volunteer groups. Ruth was predeceased by her husband Everett in 2011 and is lovingly remembered by her daughter Maureen (Garth), son Bruce, granddaughter Laura (Kevin), grandsons Robert & Jude (Rachel), great-granddaughters, Emma, Alison & Haley, and great-grandsons Ronan & Caden. Many heartfelt thanks to the Ironwood Supportive Housing staff and the doctors and nursing staff at the Pinawa Hospital. Special thanks to Lorne and Paulette Schram and Rita Bell for being such special and caring friends and always being there when needed. Funeral services and reception will be held on Friday, April 5 at 2 pm at the Pinawa Alliance Church, 1 Bessborough Ave (at Burrows Rd), Pinawa. In lieu of flowers, donations can be made to the Pinawa Foundation at endowmanitoba.ca or P.O. Box 100, Pinawa, MB. R0E 1L0. Pinawa will certainly miss Ruth! It was evident in so many ways that she loved living her life in Pinawa. Reading Ruth’s tribute brought back so many memories of our years in Pinawa (1967-70). It would be about fifty years ago, around this time, that I curled in a mixed bonspiel with her. Our skip had frequented a few watering holes before each game , so we came out on the losing side. But we had a great time, as we always did when we were in Ruth’s company. Dave and I send our condolences and hugs to you, Maureen and Garth, and your family. You will always hold her memories in a special place in your hearts. We’re going to miss her terribly, but remember her with a smile, always. Thank you so much Louise for your kind words, she certainly lived life to the max. You mentioned hi-jinks and there was often more than the occasional hi-jinks. She never lost her sense of humour. To us, Ruth will always be known as the Grande Dame of Pinawa. She will be in good company in Heaven. Our sympathy to the family, she was wonderfully proud of you. I will truly miss my dear friend Ruth. I always wished I could grow old as gracefully as she did. My sympathies to her family. She will be missed. Where to begin, so I will just sum up how dearly our Mothers treasured each other. Their lived were woven together in 1963 and just grew with each year. Ruth & Mum could tell stories and laugh telling those stories. The last 6 years of Mum’s life,Ruth always wanted to share the visits to my place for tea with Mum and several trips to Whitemouth for lunches and Birthdays. My heart smiles when I think of those times and the hugs and love these ladies shared. My thoughts are with at this sad time.